Does Bill De Blasio Have Groundhog Blood On His Hands? It looks like "Staten Island Chuck" is yet another victim of progressivism. New York Mayor Bill de Blasio was holding up Chuck, the "Punxutawney Phil" of New York, on Feb. 2 when he infamously fumbled the winter-weather prognosticator, who fell nearly six feet to the ground. The groundhog was found dead a week later. Now, the New York Post reports that there may have been a zoo coverup to keep de Blasio—and the public—from finding out about the details of the innocent beast's demise. Instead of revealing the sad loss, the zoo—which gets nearly half of its $3.5 million in annual funding from the city—told the staff to keep the mayor’s office in the dark about the animal’s fate. 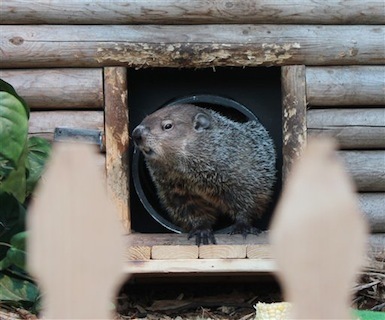 They told only a few zoo supporters—but claimed that the groundhog had died of natural causes. "I was told he died of old age, that he went to that big farm in the sky," said Assemblyman Matthew Titone (D.), who later learned how the animal had died. While the Post‘s reporting seems to indicate that the zoo, rather than the mayor's office, drove the coverup, comparisons are sure to be drawn between the mysterious circumstances surrounding the incident and the tragic details of an earlier scandal that befell the career of another hero of progressivism, the late Senator Ted Kennedy (D., Mass.). This entry was posted in Culture and tagged Bill de Blasio, Murder, New York. Bookmark the permalink.